Most Honda V6 engines leak oil from the front plate. 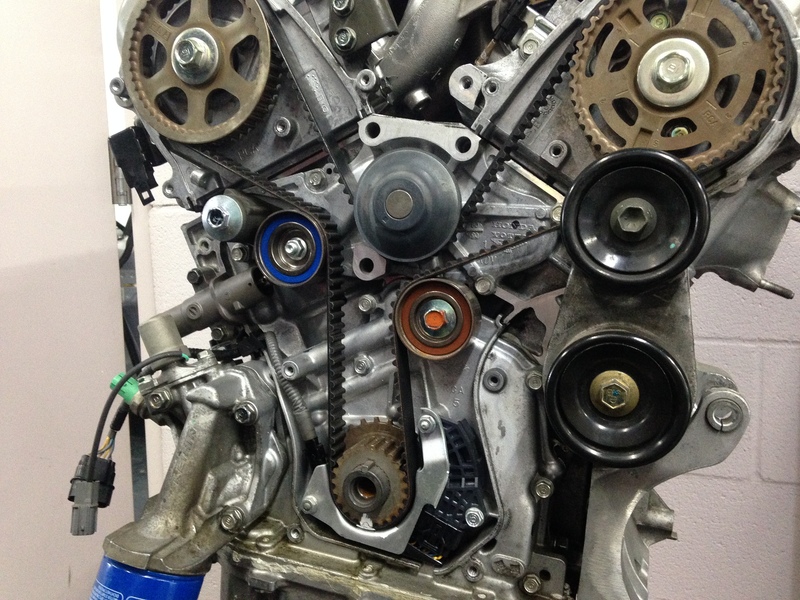 The front plate is actually the oil pump of the engine and it is located behind the timing belt assembly. Front Plate Assembly: This is the oil pump assembly for Honda and Acura V6 Engines. 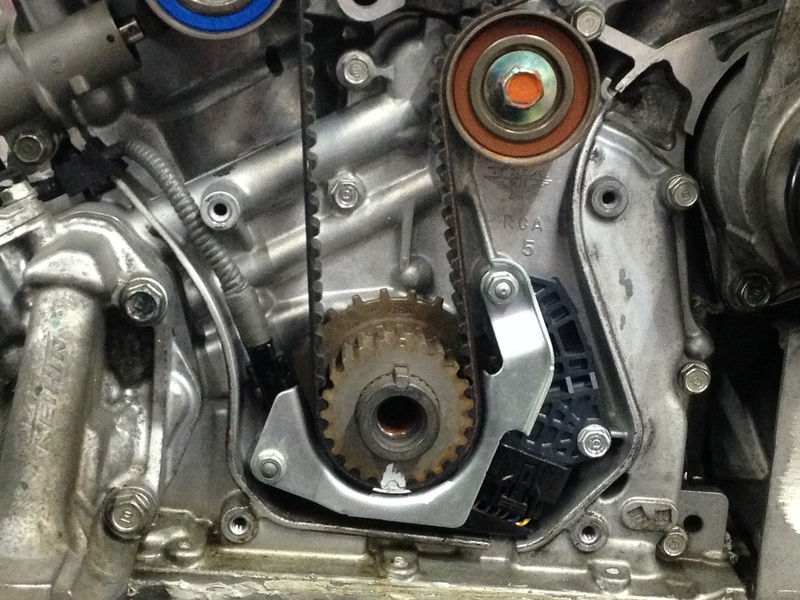 It is located directly behind the timing belt. The large hole in the middle is where the front pulley comes through. The seals that are associated with this front plate are sealing pressurized oil. Over time, these rubber seals will shrink, get hard and brittle. This happens because of a few reasons. First, rubber and petroleum don’t naturally like one another. Over time, the oil will break down the rubber that makes up the seal’s construction. Second, these seals are constantly warming up and cooling off, every time the engine is started and shut off. After about 10 years, these seals have heated up and cooled off hundreds of times. 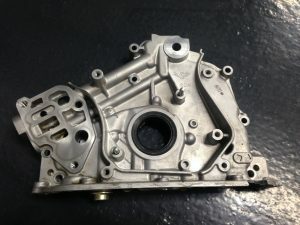 In addition, the Honda engine components are mostly aluminum construction. When it gets cold, the aluminum shrinks and during engine warm-up, the vulnerable sealed areas leak oil even more. As the engine reaches operating temperature, the aluminum expands and a better sealed area will result. 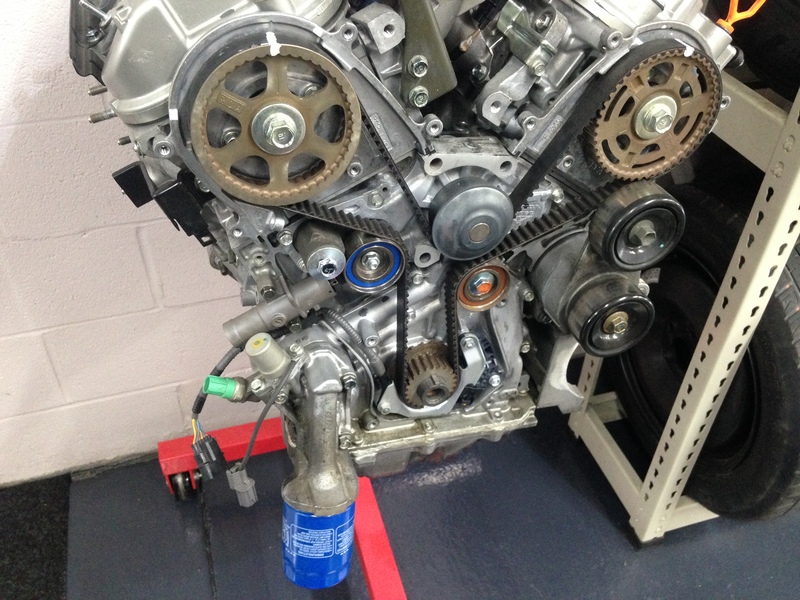 All Honda V6 engines currently incorporate the use of a timing belt. Honda cars that are equipped with the V6 engine include the Honda Accord V6, Honda Ridgeline, Honda Odyssey van, and Honda Pilot. American Honda Motor Company recommends the replacement of this belt at 7 years or 105,000 miles. At Accurate Automotive, we have started checking for leakage in the front plate area whenever a timing belt replacement procedure is performed. This is because the timing belt and the oil pan both have to be removed to re-seal the front plate. 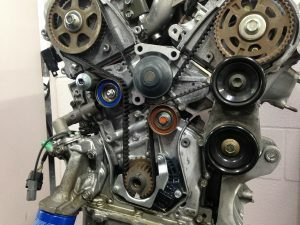 While this is an additional cost during a timing belt replacement procedure; it is considerably cheaper to perform a front plate re-seal during the timing belt replacement interval instead of having to remove all the timing belt components between timing belt replacement intervals because of a major engine oil leak coming from the front plate. For 20 years, the technicians at Accurate Automotive, Inc. have committed themselves to specializing exclusively in Honda and Acura automobiles. The focus of the business model is simply to assist the customers in maintaining their Honda and Acura vehicles, thereby keeping them on the road as long as possible. Some of Accurate Automotive’s customers have been coming to them for 2 decades and continue to drive Honda and Acura products because they like the shop. Come in and see why Accurate Automotive, Inc. is the best place in Nashville and Middle Tennessee to purchase and service your Honda and Acura automobiles.